The life and adventures of two miniature dachshunds called Lily & Severus. This is a post I probably should've written on so many occasions but i've either not wanted to or not felt the need to but this time is an exception. 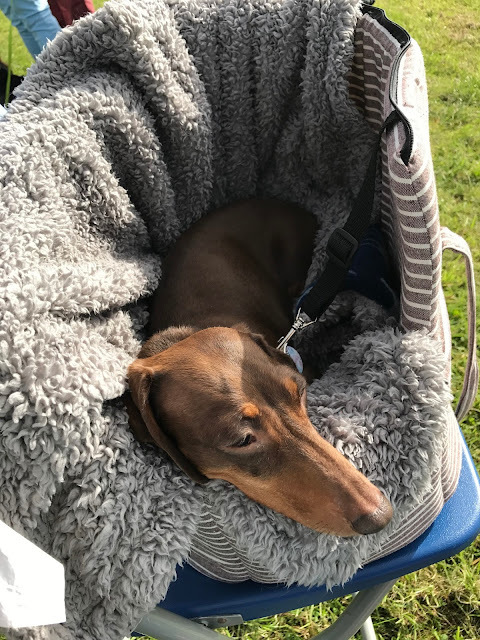 For those that don't know Lily suffers from IVDD (Intervertebral Disk Disease) which affects 1 in 4 dachshunds at some point during their lives. Lily has gone down on three separate occasions; May 2015, six months later January 2016 and most recently July 2017. On none of these occasions has anything happened to "cause" it, in some dachshunds its inevitable as is the case with Lily. The first two times her back has gone we were referred to Southern Counties Veterinary Specialists who operated on her both times, each time she has been operated on she made a full recovery to the point you couldn't actually tell that anything had been wrong with her (I was incredibly strict with Lily's recovery and did everything I was told and restricted her exercise/out of crate time and i'm sure that is why she recovered so well!) after the operation in January I decided that if it happened again that despite my vet and the insurance being willing to operate again (and again!) that we wouldn't put Lily through it again (more on that later), so when it went again in July we pursued a conservative treatment plan. I noticed that afternoon almost 3 months ago that Lily was off colour and not as enthusiastic as she usually is about things, so that to me was a warning sign that something wasn't right. I restricted her activity and put her in her crate to rest, as the weekend progressed I noticed she was getting wobbly and reluctant to move, so the following monday morning we rushed her to the vets, to have our usual vet confirm it was her back once again. Having done the surgery route twice I could probably write a book on the aftercare/what to expect but this time we went into it blind! The basic idea of it is the same; strict crate rest, strong painkillers (Gabapentin in Lily's case) and an anti-inflammatory (Metacam for her). 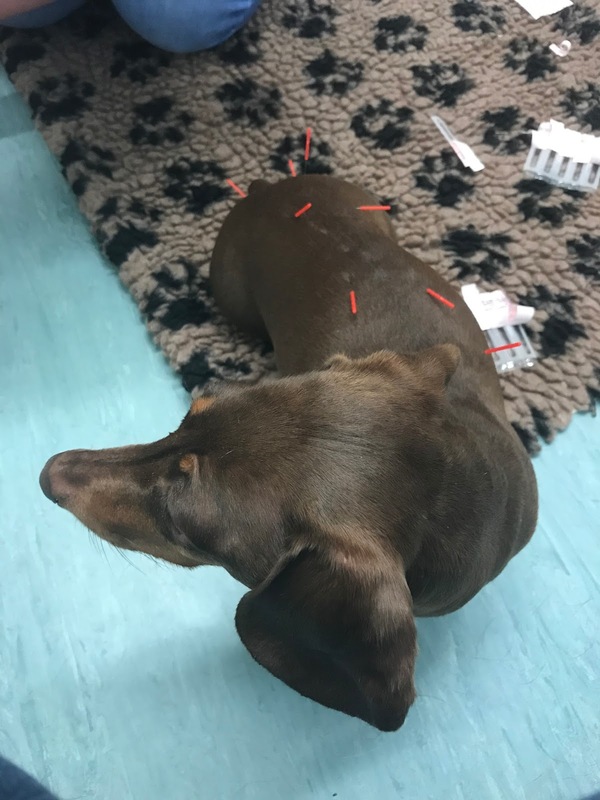 Because our local vet is absolutely brilliant she is also a fully qualified to administer acupuncture, we have been going to weekly acupuncture sessions where Honor (our vet) usually inserts 13 needles into the various pressure points, by doing this is releases endorphins which encourages blood flow to the various points, Lily finds acupuncture quite calming and is always very settled whilst at the vet, which in itself is a miracle because after all the trips to specialists she gets incredible stressed, but it is something we are working on. Letting the needles do their thing! Each time we've operated on Lily once we've brought her home she always suffered from terrible separation anxiety (each time she's had surgery i've and to take a month off of work because I couldn't leave her without her getting very worked up) and car journeys after where always an absolute nightmare because she'd stress and pant. I'd thought she was bad before, but it was nothing compared to what she's been like this time, every time I leave the room she would scream loudly and get incredibly worked up (she has gotten so bad we've been giving her Zlykene daily, although it's not stopped the SA it's definitely helped!). The last few months have been hell really, as much as I didn't want to describe it like that, thats the honest truth. 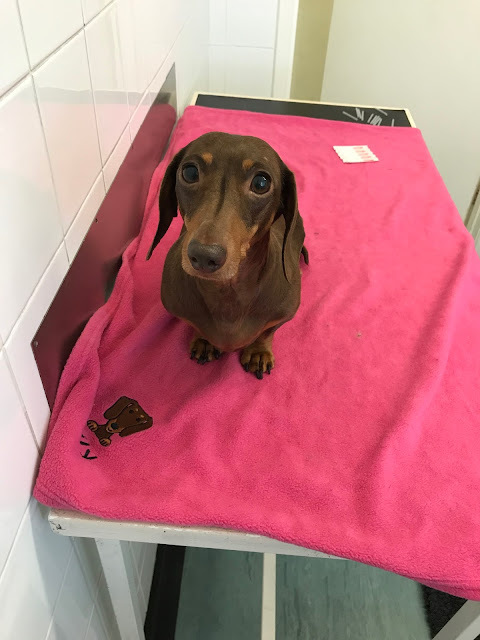 Which is part of the reason i've sat down to write this, so many people take on Dachshunds or come up to me telling me that they'd love one and literally have no idea what they are getting themselves into. Within in the first fortnight after going down Lily was in so much pain that i'd made the decision to have her PTS each time she continued to fight - it's down to her sheer resilience that she is still going, and on the third occasion I'd even got as far as calling the pet crematorium, watching her struggle and not even being able to toilet by herself was utterly heartbreaking, there really are no words to describe what she's been through; IVDD is so hideously cruel to witness. Another thing i've dealt with this time is guilt, now that might sound ridiculous, but each time previously where she had been operated on I felt like I'd actually done something to help her, the conservative option is good as a last resort but to watch your dog get steadily worse (which is normal according to my vet!) by the day is utterly soul destroying, and something nobody ever seems to mention. 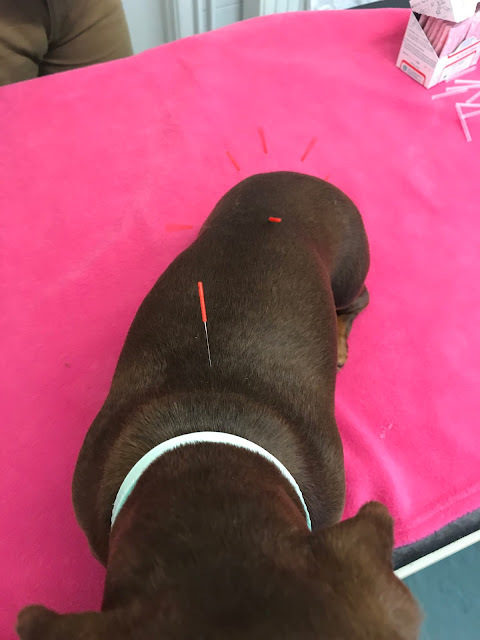 But due to Lily's sheer determination and a little help from acupuncture she's back up and about, albeit rather wobbly at times but our vet is confident she will continue to get better, the simple things like watching her beat Sev up, wag her tail and stomp her feet as she barks are things I honestly didn't think she'd do again! We did try hydrotherapy a few weeks ago as some of you may have seen on Twitter, Lily has a serious dislike for water, hates being bathed and point blank refuses to go in the sea but we decided to give it a try anyway! The first time she did great and it seemed to help, but the second session a week later was clearly too much for her and ended up with her loosing control of her legs again, we've slowly built her back up since then but I'd definitely think twice before doing that again but thats just my experience! As I finish typing this Lily is snoring on my lap quite oblivious to the chaos she's caused; but happy and very much alive and that's good enough for me and makes all the tears oh so worth it! If you have anymore questions please feel free to contact me. I know this hasn't been the cheeriest of posts but I wanted to be honest in the hope it may help someone else in the future. I'm so pleased that she is better-she is so lovely. Glad to know that acupuncture helped her. Lily seems the most adorable Dachshund- just like my own Rhythm...i mean she has eyes like Rhythm's, or the other way round, as Rhythm is just seven months old right now. I have three Dachshunds- Dash (13+ years), Rhythm and her brother Flow (born in Sep 2017)- still pups. I know my Dash suffered this prolapsed disc thing in the past and he was paralyzed for a few months around eight years of age. But with sheer will we all got him back. He's been fine ever since. I send my love and best wishes for Lily and pray she stays well in the years ahead of her. Thanks for sharing your journey with Lily and IVDD. I don't have a dachshund but am friends with those on twitter and instagram who do. And now getting to know you & your dachshunds. I'll have to catch up with you on instagram too. I'm rather fond of them even not having one of my own. I didn't even know what IVDD was until others with their doxies were going through it. I hope Lily continues to do well and thankful acupunture is helping her. I know you want what's best for her and love her lots. I love that as you were writing this she was snoring on your lap. I look forward to your sharing more. 2017 Christmas Gift Guides - Want To Join In? The Travall Dog Guard & Why We Think It's Fab!